Chris Brown just can't seem to hold it together. 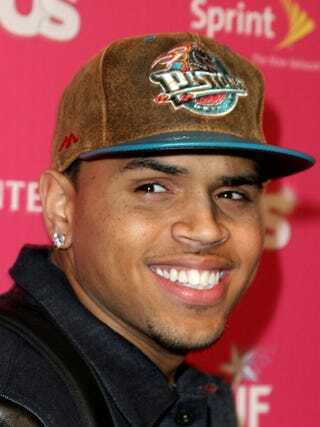 Fresh from our "Still throwing temper tantrums" file, R&B singer Chris Brown is in the hot seat again, this time for making what some are calling homophobic comments against Raz B, former member of the music group B2K, who has recently claimed that a fellow group member and relative molested him during his time in the group. Raz B made a comment on Twitter about how he didn't understand how men like Brown and Eric Benet could mistreat women like Rihanna and Halle Berry. Brown took to Twitter, calling him the n-word and chiding him about the molestation. Raz B's brother Ricky Romance subsequently issued a death threat to Brown via Twitter. Brown retaliated again and then issued an apology after fans and pundits began calling him on his homophobic comments. Brown told TMZ, "Yesterday was an unfortunate lack in judgment sparked by public Twitter attacks from Raz B, who was bent on getting attention. Words cannot begin to express how sorry and frustrated I am over what transpired publicly on Twitter." Brown continued, "I have learned over the past few years to not condone or represent acts of violence against anyone. Molestation and victims of such acts are not to be taken lightly; and for my comments I apologize — from the bottom of my heart." Awww. We chalked up Chris Brown's misdeeds to youth, but now it appears to be stupidity. How do you get engaged in this foolishness just two weeks after being praised by a judge for adhering to court requirements and completing a domestic violence course? Violence and anger seem to be the order of the day for Brown and Ricky Romance. This incident proves that Brown is far from healed and has a whole lot of growing up to do.